Good morning out there Tampa and future Tampa residents! 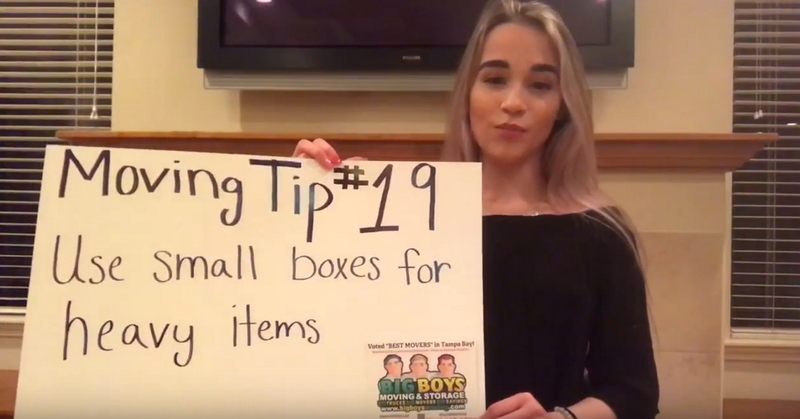 Big Boys Moving and Storage here again with another video moving tip of the day! Today’s tip is number twenty in our video moving tip of the day series of video clips. If you haven’t already, make sure that you check our YouTube channel or surf our blog to catch up on the whole video series! It may sound silly to remind you to use packing tape when you are packing for your move, but it’s a tip that a lot of people don’t think about! Many people think that they can improvise by using other types of tape to secure their boxes, but the truth is that packing tape is unique in its strength and adhesive properties. Using other types of tape can soon result in the bottom falling out of your boxes and your belongings being dropped on the floor! If you’re looking for an experienced moving company who will take care of your move at an affordable price but take the utmost care of your belongings, Big Boys Moving and Storage can help! Voted the top moving company in Tampa Bay for residential and commercial moves, we just know that you’ll be satisfied! Here at Big Boys Moving and Storage, we have a lot of great tips and tricks to help your move go well! We want to save you money, save you time, and get your move done well and on your deadline. If you’re looking for more help to make your move go smoothly, head over to our Google or Facebook pages, and look at more of our moving tips! Are you already ready to get your move underway? Pick up the phone and don’t forget to ask about our moving specials too so that you can save more money on top of our affordable rates! Just dial 727-773-8111 or 813-936-2699 today!